As soon as the first leaves start falling and there's a chill in the air, I want Chicken Provencal Stoup. What is stoup? "Stoup" is thicker than traditional soup, but thinner than stew. This "stoup" recipe has become our go to recipe for chicken soup, which can be made in about 30 min., and it's wonderful. A hint for the prep is to cut, chop and, slice, before you start the actual cooking. I adapted the recipe from Rachael Ray's Chicken Provencal Stoup. It has chicken, obviously, carrots, zucchini, baby red potatoes, onions, garlic, Herbes de Provence, canned diced tomatoes, white wine and chicken stock. I didn't add the red pepper. 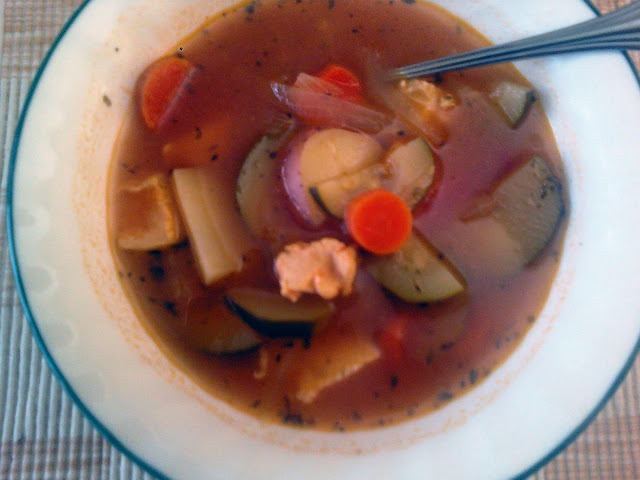 The Herbes de Provence and the wine, make this soup. After you add the Herbes de Provence and wine, your kitchen smells heavenly, as the vegetables saute. Because we have health issues in our house, I used no salt tomatoes, and added no additional salt. My husband loves this stoup, and doesn't miss the salt, because of the Herbes dr Provence. We try to heat "healthy" most of the time with the exception of an occasional Boeuf Bourguignon or Coq Au Vin. At the end of the recipe it is suggested that you put an olive tapenade in the bowl, before serving. Again, because of sodium issues, I didn't use the tapenade. I imagine that it's wonderful, though. This is a very versatile recipe because I used green beans, when I didn't have any zucchini in the house, and I wanted to make the stoup. You could also add noodles if you want or even roasted squash.. I'm going to have some for lunch today:) Why don't you join me? What are your favorite soups or "stoups"? I like this, I like to use all low or no sodium products too, they are better for everyone. I like thicker soups, stoups funny name! I bet the olive tapenade would be good. Wish I could join you for lunch! -Gina I wish that you could join me, too. Are you coming to Chicago anytime soon.? My own husband had high blood pressure...so we cut out a lot of salt from our diet. Now we love making soup with no additional salt...but it definitely takes some getting used to! Thank you for sharing Becky...this looks great! -Lisa I agree with you, that the food is more flavorful with the herbs and spices. It's not easy, but we're trying. I'm going to your blog right now! -blackkitchendiaries Thank you for your comments.